Are you familiar with a Food Journal? It is a record of everything you eat: meals, snacks, food from restaurants, fast food joints, drive-thrus, food from vending machines, food eaten in your car, food prepared by someone else, etc. If you put it in your mouth, you record it in your journal. Before my Real Food journey, I kept a Food Journal. WOW! Talk about a wake-up call. I thought I knew what I eat throughout the day. And I thought that my eating habits were pretty healthy. Wrong and Wrong! Couldn't be more Wrong-er!! Turns out, I was eating ultra-processed junk (UPJ) throughout the day. But because these were small bits of UPJ, it was hard to keep track. So I was fooled. And these small bits amounted to a heap of UPJ by the end of the day. This was the opposite of health. . . .This was bad. But the upside is that this journaling exercise prompted me to re-assess my dietary habits. And motivated my Real Food journey. Keep an E-Journal if its easier for you. 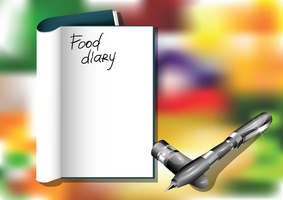 If you are truly honest, a Food Journal will be a useful tool for your Real Food Toolbox. It provides accountability. And, as I learned, can help pinpoint what eating habits need to be changed or adapted in order to meet your goals. Is there a particular time of day that you tend to get off track with your Real Food goals? Is there a particular event that prompts you to grab for the UPJ? Are you a stress-eater? I bet many of us are. A food journal will help diagnose these barriers. A Food Journal is also a complete view of your journey. If you start feeling frustrated or wondering about progress, review your Food Journal to know how well and how far you have progressed, to understand your struggles. Are you struggling with your Real Food goals? Try keeping a food journal. It can be written, photos, or combination of these. I am sure there are Food Journal Apps -- seems like there's an App for everything these days :-) If you eat packaged food, take a photo of the ingredients too. Or if you are keeping a written journal, record the primary ingredients. Have you kept a food journal? And if so, did it help? Share your journaling experiences - Let's have this conversation!